In Amsterdam tourism is not just another industry - it's a way of life. This brief tourist guide suggests things to see and do in Amsterdam and gives practical tips. With so much to see in the city, appealing to such different groups, it's hard to talk about Amsterdam tourism as a single entity. If high minded cultural pursuits are your thing, Amsterdam has more museums per square meter than any other European capital. If you've come to let loose, the city's vibrant club scene might be more for you. Amsterdam's picturesque canals are one of the city's main attractions, and booking a canal cruise is a very popular way to spend the day, or even a candle lit evening. Hotels often offer to book trips for guests, or you can approach one of the many tour operators based along Damrak (the busy, waterfront street stretching from Central Station to Dam Square). 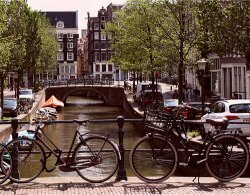 If traveling on the water isn't your thing, then renting a bicycle will allow you to see Amsterdam the way a local does. Nothing is more unique to Amsterdam tourism than cycling through the 17th century streets on an authentic Dutch city bike. Bike rental companies are dotted throughout the city centre, just keep an eye out for the brightly colored, advertising laden rental bikes. 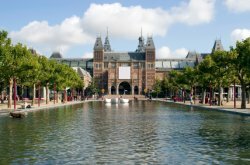 Museums in Amsterdam are easy to find, with the aptly named Museumplein playing host to both the Van Gogh Museum and the Rijksmuseum. There is a museum for everything in Amsterdam - even people who want to spend their day in the Handbag Museum are accommodated. Those looking for an authentic Dutch experience should check out Amsterdam's pubs, known as brown cafés, or spend their time tasting Jenever (gin) in one of Amsterdam's proeflokalen (tasting houses). These very Dutch establishments allow tourists to connect with the culture of old Amsterdam. They are hardly touristy and you can expect to share a bench with the locals who form the establishment's regular crowd, as well as those visiting from overseas. 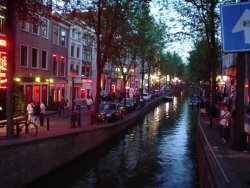 The Red Light District, located just to the south east of Central Station is something most visitors to the city like to see. Here women in windows strut their stuff while coffeeshop crowds produce clouds of smoke that have very little to do with coffee. 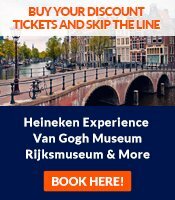 While Amsterdam tourism has more to offer than illicit thrills and spills, as something unique to the city this area is worth a look. In the city centre, tourists can visit Madame Tussauds, the Amsterdam Dungeon and other attractions created specifically for the city's tourist industry. Don't expect to meet many Dutch people here however, other than those behind the counters, as locals tend to avoid these places as 'tourist traps'. 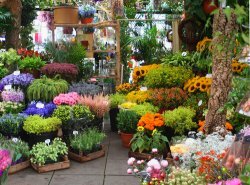 The Flower Market near Leidsestraat is one Amsterdam tourism hotspot that makes for a brighter trip to the city. The Netherlands is famous for its tulips and here you can find them in practically every color in the rainbow, plus a few colors that aren't. No visit to Amsterdam would be complete without seeing the Anne Frank House. This is the preserved house where Anne Frank wrote her famous diary while in hiding. It's one of the more sober monuments to the city's history. Easily reached within the city centre at Westermarkt, the tour takes about an hour and is one of the most memorable Amsterdam sights to see. The major obstacle in tourist Amsterdam is crowds. Showing up to the Van Gogh Museum on a Saturday just after lunch is a good way to stand in line for hours looking at the, admittedly well designed, exterior of the building. Fortunately, most museums and attractions allow you to book tickets in advance, either from the museum's website or one of the many tourism offices in the city, such as the one to be found just outside Central Station. Alternatively, you can plan your trip during the week when things are quieter throughout Amsterdam tourism tends to run high in the weekends in this most popular of city break destinations.